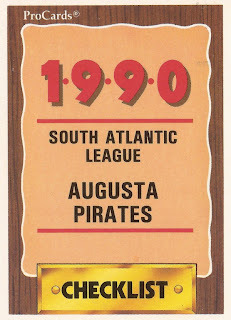 Features on each member of the 1990 Augusta Pirates, single-A affiliate of the Pittsburgh Pirates. Players are as included in that year's team set. Austin Manahan heard he might go high. He didn't expect that high. 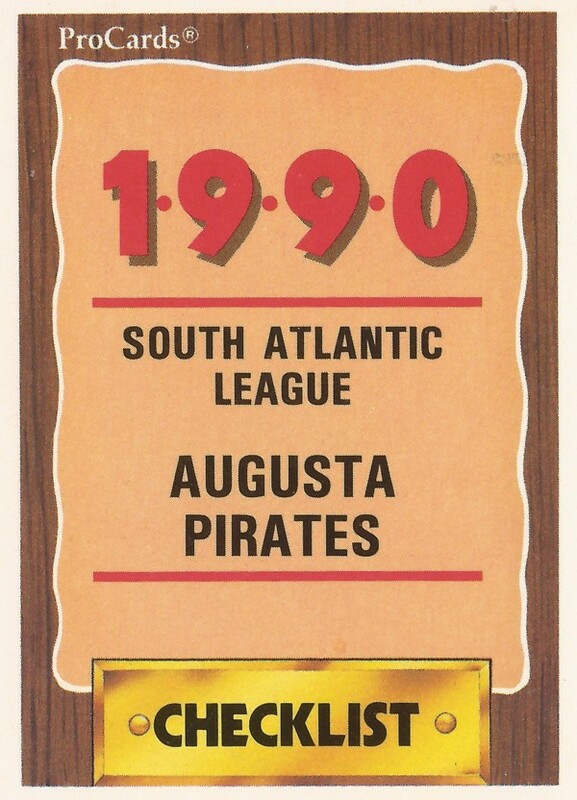 Felix Antigua gave his single-A Pirates a good start in a 1990 contest. He played four seasons, never made the bigs. Scott Arveson pitched well for Augusta in a July 1990 game. He played four seasons as a pro, never made the bigs. Rich Aude worked to be consistent, then made the the Pirates. He played in three major league seasons. David Bird pitched well enough for Chapman College to get a pro career, but not a long one. Michael Brewington remains in his college's record book. His impact on the pros was more fleeting. Lee Driggers played in the minors, but he got so much more satisfaction out of coaching. Willie Greene could have played basketball or football. Baseball, though, was his game. Bill Holmes put on a hitting display in college. He couldn't put on one in the pros. He played just two seasons. Brent Honeywell took what he learned in college to his job as a high school coach. He played three seasons as a pro. Deron Johnson found his niche in scouting. He became head scout for the Twins. His playing career lasted three seasons. The Pirates liked what they saw in Austin Manahan. He ended up playing eight seasons, but he never made the bigs. Ramon Martinez went four pro seasons, served mostly as a reliever. He never made the majors. Wayne Masters only got two seasons as a pro. He never got to see the big championship city of Pittsburgh. Jason Nixon made the Marshall University record books. He played a single season as a pro. Eric Parkinson had a incredible feeling pitching against AAA players in an exhibition. He never got into an actual AAA game. Will Pennyfeather played for nearly two decades. He made the bigs in three seasons with the Pirates. Darryl Ratliff ran down balls in 11 pro seasons. He never got the chance to do so in the majors. Roman Rodriguez never made the bigs as a player. He made it as a bullpen catcher. He's served with the Yankees for a decade. Kevin Rychel pitched well in 1990, even on a pitch count. He played eight seasons, but he never made the bigs. Delvy Santiago as a scout saw potential in a prospect. That prospect made the bigs, Delvy didn't. Winston Seymour had little luck on one night in 1989 and had little luck with a long career. He never made AA. Jessie Torres didn't hit a lot of home runs, but he hit one this night in August 1992. He never made the bigs. Ken Trusky wanted to get off to a good start. He never got a good enough start to make AA. Bobby Underwood was fortunate his college coaches pitched him when they did. He got a four-season pro career. Paul Wagner had it fixed for one night, then saw a no-hitter go past him with one out to go. Ron Way played four seasons as a pro, but never made it out of high-A. He has since helped open a restaurant.